Curtis James Jackson III (born July 6, 1975), better known by his stage name 50 Cent (often pronounced "fitty cent"), is an American rapper, entrepreneur, investor, record producer, and actor. He rose to fame with the release of his albums Get Rich or Die Tryin' (2003) and The Massacre (2005). His album Get Rich or Die Tryin' has been certified eight times platinum by the RIAA. Born in the South Jamaica of Queens, New York City, Jackson began drug dealing at the age of twelve during the 1980s crack epidemic. After leaving drug dealing to pursue a rap career, he was shot at and struck by nine bullets during an incident in 2000. After releasing his album Guess Who's Back? in 2002, Jackson was discovered by rapper Eminem and signed to Interscope Records. With the help of Eminem and Dr. Dre, who produced his first major commercial successes, Jackson became one of the world's highest selling rappers. In 2003, he founded the record label G-Unit Records, which signed several successful rappers such as Young Buck, Lloyd Banks, and Tony Yayo. Jackson has engaged in feuds with other rappers including Ja Rule, Nas, Fat Joe, Jadakiss, Cam'ron, Puff Daddy, Rick Ross, and former G-Unit members The Game and Young Buck. He has also pursued an acting career, appearing in the semi-autobiographical film Get Rich or Die Tryin' in 2005, the Iraq War film Home of the Brave in 2006, and Righteous Kill in 2008. 50 Cent was ranked as the sixth-best artist of the 2000s by Billboard magazine. The magazine also ranked him as the fourth top male artist and as the third top rapper behind Eminem and Nelly. Billboard magazine also ranked him as the sixth best and most successful Hot 100 Artist of the 2000s and as the number one rap artist of the 2000s. Billboard ranked his album Get Rich or Die Tryin' as the twelfth best album of the 2000s and his album The Massacre as the 37th best album of the 2000s. As of September 2011, 50 Cent is working on his fifth studio album, which is set to be released in 2012. Jackson started rapping in a friend's basement where he used turntables to record over instrumentals. In 1996, a friend introduced him to Jam Master Jay of Run-DMC who was organizing his label Jam Master Jay Records. Jay taught him how to count bars, write choruses, structure songs, and create a record. Jackson's first official appearance was on a song titled "React" with the group Onyx on their 1998 album Shut 'Em Down. He credited Jam Master Jay as an influence who helped him improve his ability to write hooks. Jay produced Jackson's first album; however, it was never released. In 1999, after leaving Jam Master Jay, the platinum-selling producers Trackmasters took notice of Jackson and signed him to Columbia Records. They sent him to a studio in Upstate New York where he produced thirty-six songs in two weeks. Eighteen were included on his unofficially released album, Power of the Dollar in 2000. He also started the now-defunct Hollow Point Entertainment with former G-Unit affiliate Bang 'Em Smurf. Jackson's popularity increased after the successful but controversial underground single, "How to Rob", which he wrote in half an hour while in a car on the way to a studio. The track comically explains how he would rob famous artists. He explained the reasoning behind song's content as, "There's a hundred artists on that label, you gotta separate yourself from that group and make yourself relevant". Rappers Jay-Z, Kurupt, Sticky Fingaz, Big Pun, DMX, Wyclef Jean and the Wu-Tang Clan replied to the song and Nas, who received the track positively, invited Jackson to travel on a promotional tour for his Nastradamus album. The song was intended to be released with "Thug Love" featuring Destiny's Child, but two days before he was scheduled to film the "Thug Love" music video, Jackson was shot and confined to a hospital due to his injuries. On May 24, 2000, Jackson was attacked by a gunman, alleged to be Darryl "Hommo" Baum, outside his grandmother's former home in South Jamaica, Queens. He went into a friend's car, but was asked to return to the house to get jewelry. His son was in the house, while his grandmother was in the front yard. Upon returning to the back seat of the car and already seated, another car pulled up nearby. An assailant then walked up to Jackson's left side with a 9mm handgun and fired nine shots at close range. He was shot nine times: in the hand (a round hit his right thumb, to where the bullet passed through and out his little finger), arm, hip, both legs, chest, and his face (his left cheek). The face wound resulted in a swollen tongue, the loss of a wisdom tooth, and a small slur in his voice. His friend also sustained a gunshot wound to the hand. They were driven to the hospital where Jackson spent thirteen days. Baum, the alleged shooter, was killed three weeks later. He was also Mike Tyson's close friend and bodyguard. Jackson recalled the incident saying, "It happens so fast that you don't even get a chance to shoot back.... I was scared the whole time.... I was looking in the rear-view mirror like, 'Oh @#! *% , somebody shot me in the face! It burns, burns, burns.'" In his autobiography, From Pieces to Weight: Once upon a Time in Southside Queens, he wrote, "After I got shot nine times at close range and didn't die, I started to think that I must have a purpose in life... How much more damage could that shell have done? Give me an inch in this direction or that one, and I'm gone". He used a walker for the first six weeks and fully recovered after five months. When he left the hospital, he stayed in the Poconos with his then-girlfriend and son. His workout regime helped him attain his muscular physique. While in the hospital, Jackson signed a publishing deal with Columbia Records. However, he was dropped from the label and "blacklisted" in the recording industry because of his song "Ghetto Qu'ran". Unable to find a studio to work with in the U.S, he traveled to Canada. Along with his business partner Sha Money XL, he recorded over thirty songs for mixtapes, with the purpose of building a reputation. According to Shady Records A&R Marc Labelle in an interview with HitQuarters, Jackson shrewdly used the mixtape circuit to his own advantage saying, "He took all the hottest beats from every artist and flipped them with better hooks. They then got into all the markets on the mixtapes and all the mixtape DJs were messing with them." Jackson's popularity rose and in 2002, he released material independently on the mixtape, Guess Who's Back?. Beginning to attract interest, and now backed by G-Unit, Jackson continued to release music including 50 Cent Is the Future. The mixtape revisited material by Jay-Z and Raphael Saadiq. In 2002, Eminem listened to a copy of Jackson's Guess Who's Back? CD. He received the CD through Jackson's attorney, who was working with Eminem's manager Paul Rosenberg. Impressed with the album, Eminem invited Jackson to fly to Los Angeles, where he was introduced to Dr. Dre. After signing a id="mce_marker" million record deal, Jackson released the mixtape, No Mercy, No Fear. It featured one new track, "Wanksta", which was put on Eminem's 8 Mile soundtrack. He was also signed to Chris Lighty's Violator Management and Sha Money XL's Money Management Group. In February 2003, Jackson released his commercial debut album, Get Rich or Die Tryin'. Allmusic described it as "probably the most hyped debut album by a rap artist in about a decade". Rolling Stone noted the album for its "dark synth grooves, buzzy keyboards and a persistently funky bounce" with Jackson complementing the production in "an unflappable, laid-back flow". It debuted at number one on the Billboard 200, selling 872,000 copies in the first four days. The lead single, "In da Club", which The Source noted for its "blaring horns, funky organs, guitar riffs and sparse hand claps", broke a Billboard record as the most listened-to song in radio history within a week. Interscope granted Jackson his own label, G-Unit Records in 2003. He signed Lloyd Banks, Tony Yayo, and Young Buck as the established members of G-Unit. The Game was later signed under a joint venture with Dr. Dre's Aftermath Entertainment. In March 2005, Jackson's second commercial album, The Massacre, sold 1.14 million copies in the first four days-the highest in an abbreviated sales cycle- and peaked at number one on the Billboard 200 for six weeks. He became the first solo artist to have three singles on the Billboard top five in the same week with "Candy Shop", "Disco Inferno", and "How We Do". Rolling Stone noted that "50's secret weapon is his singing voice - the deceptively amateur-sounding tenor croon that he deploys on almost every chorus". After The Game's departure, Jackson signed singer Olivia and rap veterans Mobb Deep to G-Unit Records. Spider Loc, M.O.P., 40 Glocc and Young Hot Rod later joined the label. Jackson expressed interest in working with rappers outside of G-Unit, such as Lil' Scrappy of BME, LL Cool J from Def Jam, Mase from Bad Boy, and Freeway of Roc-A-Fella, some of whom he recorded with. In September 2007, he released his third album Curtis, which was inspired by his life before Get Rich or Die Tryin'. It debuted at number two on the Billboard 200, selling 691,000 units in the first week, behind Kanye West's Graduation, whom he had a sales competition with, as both albums were released on the same day. He confirmed on TRL on September 10, 2008 that his fourth studio album, Before I Self Destruct, will be "done and released in November". On May 18, 2009, Jackson released a song entitled "Ok, You're Right". The song was produced by Dr. Dre and was included in Before I Self Destruct. 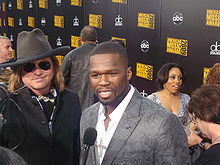 In Fall 2009, 50 Cent appeared in the new season of VH1's Behind The Music. On September 3, 2009 months upon the release of his "Before I Self Destruct" album 50 Cent posted a video for the Soundkillers' Phoenix produced track "Flight 187" which introduced his mixtape, the 50th LAW, and was also featured as a bonus track on his iTunes release of Before I Self Destruct. The song ignited speculation that there was tension between rapper 50 Cent and Jay Z for Jackson's comments in the song. In an interview with the British entertainment website ContactMusic, 50 Cent announced that he was working on a dance album named Black Magic. 50 Cent said he was inspired by the European nightclubs. "First they played hip-hop which suddenly changed to uptempo songs, known as Eurodance". He went on The Invitation Tour in the summer of 2010, in support of Before I Self Destruct album, and the then shelved Black Magic album. He "recorded 20 songs to a whole different album concept" before he put those to the side and did something different. 50 Cent revealed that he wanted his new album to have the same "aggression" as his debut record, Get Rich or Die Tryin'. He later tweeted that the album was "80 percent done", and stated that fans can expect the album in the summer of 2011; however, the album has been delayed to 2012 at the earliest, due to tensions and disagreements at Interscope Records, Later 50 Cent said that he will release his album in November 2011 and it has also been confirmed that "Black Magic" will not be the album's title. 50 Cent has already confirmed that Eminem will appear on the album, but he also confirmed that he has been working with new producers such as Boi-1da and Alex da Kid. Cardiak, who produced Lloyd Banks' “Start It Up”, also confirmed that he had produced a song for the upcoming album. 50 Cent released the first song from his fifth studio album, titled "Outlaw", to the Internet on June 16, 2011. The single was produced by Cardiak. It was released to iTunes on July 19, 2011, although 50 Cent confirmed through his Twitter account that the song was not the album's first single. 50 Cent is set to release a book titled Playground. Unlike his previous literary efforts — which focus on his life story and the rules of power — this time he's aiming at a teen audience with a semi-autobiographical novel about bullying. According to a statement from the book's publisher, the first-person novel is slated for release in January 2012 and will tell the story of a 13-year-old schoolyard bully "who finds redemption as he faces what he's done." 50 Cent spoke to MTV in relation to the possibility of leaving Interscope Records. "I don't know," 50 told MTV News when asked if he would ink back with Interscope once his five-album deal was fulfilled. "It will all be clear in the negotiations following me turning this actual album in. And, of course, the performance and how they actually treat the work will determine whether you still want to stay in that position or not." On June 26, 2011, 50 Cent planned to shoot a music video for the lead single from his fifth studio album titled I'm On It. However, the music video never surfaced. 50 Cent spoke to Shade45 in relation guest appearances for his fifth studio album. "I did four songs in Detroit with Eminem. I did two with Just Blaze, a Boi-1da joint, and I did something with Alex da Kid. We made two that are definite singles and the other two are the kinds of records that we been making, more aimed at my core audience, more aggressive, more of a different kind of energy to it." In September 2011, 50 Cent released a song titled "Street King Energy Track #7" in attempt to promote his charitable energy drink Street King. On September 28, 2011, it was confirmed that 50 Cent is shooting a music video for his lead single from his fifth studio album titled "Girls Go Wild", which features Jeremih. On October 26, 2011, 50 Cent announced that his fifth studio album will be released in December 2011. However, the album was delayed, and it was announced that the album will now be released on July 2, 2012. Jackson has established himself in a variety of fields. In November 2003, he signed a five-year deal with Reebok to distribute a "G-Unit Sneakers" line as part of his G-Unit Clothing Company. He provided the voice-over as the protagonist in the video game 50 Cent: Bulletproof, which was released for PlayStation 2, Xbox, and the PlayStation Portable. Its sequel, 50 Cent: Blood on the Sand, was released in early 2009. He worked with Glacéau to create a vitamin water drink called Formula 50. In 2007, Coca-Cola purchased Glacéau for US$4.1 billion. Forbes estimated Jackson, who owns a stake in the company, earned id="mce_marker"00 million from the deal after taxes. He has teamed up with Right Guard to launch a body spray called Pure 50 RGX Body Spray and a condom line called Magic Stick Condoms, in which he planned to donate part of the proceeds to HIV awareness. Jackson has signed a multi-year deal with Steiner Sports to sell his memorabilia. In 2005, Jackson made a cameo appearance on The Simpsons episode "Pranksta Rap", in which he makes light of his legal troubles. The same year, he starred alongside Terrence Howard in the semi-autobiographical film Get Rich or Die Tryin'. He starred in the 2006 film Home of the Brave, as a soldier returning home from the Iraq War, traumatized after killing an Iraqi woman. Jackson is working[when?] on a role as a fighter in an Angola State Prison in Spectacular Regret alongside Nicolas Cage, and starred opposite Al Pacino and Robert De Niro in 2008's Righteous Kill, a movie regarding a police death. He also started the film production companies G-Unit Films in 2007 and Cheetah Vision in 2008. In August 2007, Jackson announced plans to launch a dietary supplement company in conjunction with his movie Spectacular Regret. In August 2005, shortly before appearing in Get Rich or Die Tryin', Jackson published an autobiography entitled From Pieces to Weight: Once upon a Time in Southside Queens. In it, Jackson explores the cultural and economic forces that led him to sell cocaine and crack, details his entrepreneurship as a drug-dealer and then as a rapper, and reflects on his own ethos and on society. On January 4, 2007, Jackson launched his G-Unit Books imprint at the Time Warner Building. He also co-wrote The Ski Mask Way, a novel about a small-time drug dealer who attempts to rob his employers, which is to be turned into a film. Jackson said he read Robert Greene's The 33 Strategies of War and worked with the author on a book titled The 50th Law, an urban take on The 48 Laws of Power. In May 2008, Jackson met billionaire Patrice Motsepe to forge a joint venture selling 50 Cent-branded platinum. In 2008, Jackson started a reality television show on MTV titled 50 Cent: The Money and the Power; the winning contestant, Ryan Mayberry, won a id="mce_marker"00,000 investment from Jackson. Jackson founded SMS Audio, selling headphones with the name Street by 50. He has pledged to donate a portion of the sales to charity. Himself Episode: "Choose Your Crew Wisely"
Himself Episode: "One Car, Two Car, Red Car, Blue Car"